By car, you must follow the instructions to the beaches south of San Jose, following the unpaved road for 4 km. In summertime, you have to pay to park (5€), and these places get full early in the morning. At that moment the road is closed at San Jose. A bus connects then the town with the main three beaches. Take the first detour on your left to the car park right for Los Genoveses beach. Look for the shadow and, if possible, try to find a place under the trees. Find one of the paths on the right side of the parking area and walk to the right end of the beach. You have then to cross over Morro de Los Genoveses, the cape that closes the beach. The path goes takes you up with a gentle slope until you see the other side. 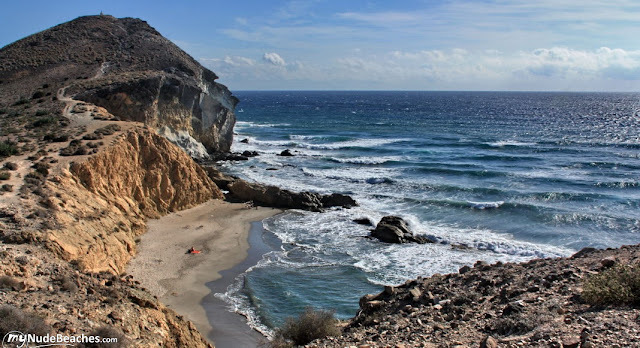 Continue to the edge of the cliffs and you will see at your foot Los Amarillos cove. Just look for the way down to the beach, which is not very easy. Its name is obvious as soon as you discover the vertical yellow cliffs that surround the beach (Amarillo = yellow in spanish). This sandy beach is not very big. Only 100 m long, and it can be quite narrow at high tide. The main advantage compared to Los Genoveses are the cliffs that offer protection against the strong wind. Like the rest of beaches in this area, everything you can find here is a restaurant along the road. Nothing at all at the beach itself. Even if this is not an official nudist beach, it is quite normal to find here naked people sharing it with textiles. If you a looking for a secluded place, take into account that you'll be perfectly visible form the top of the cliffs.